The world is too beautiful not to paint. I’ve always been fascinated with Mother Nature. I marvel at the things she creates and always strive to include some element of nature in my work, unless there is absolutely no way to pull it off. The Murder. Mixed Media on Canvas, 18″ x 24″, August 16 2016. I started doing landscapes when I started painting in 2014. 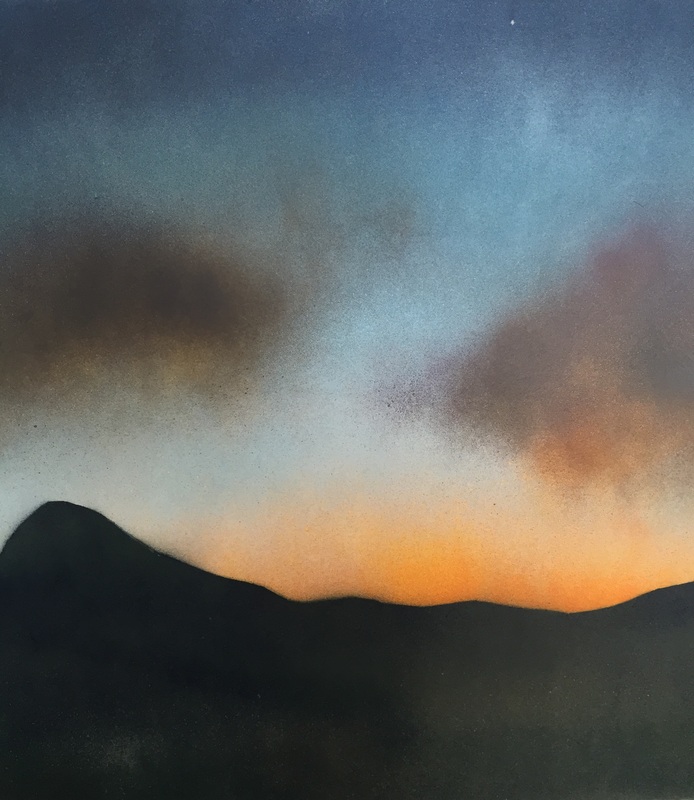 Using spray paint and drywall from my early favorite art store – Home Depot, I endeavored to recreate the cloud-scapes I would see on my way home from work. Below are the works I accomplished during those early days of painting in 2014. Sunset Panel One. Spray Paint on Drywall (Gypsum Board). 24″ x 24″, March 2014. Panel One. Sunset Panel Two. Spray Paint on Drywall (Gypsum Board). 24″ x 24″, March 2014. Panel Two.. The above paintings were my first two paintings. The first is a sunset typical for the time of day that I would get off work and have to commute across the state. For panel two, I turned the ‘canvas’ upside down and used paint rivulets to achieve the effect of cacti – although there are absolutely none in the state of Maryland. Sunset on a Tropical Island. Spray Paint on Drywall (Gypsum Board). 24″ x 24″, July 2014. Freedom. Spray Paint on Drywall (Gypsum Board). 24″ x 24″, July 2014. The painting to the left is a tropical sunset. Knowing nothing about art, I used cotton balls to try and get a cloud-like effect with the paint. I failed. Yet in failing, I succeeded. You see, the cotton got stuck to the drying spray paint and I couldn’t get it off. Leaving it on created a unique effect. 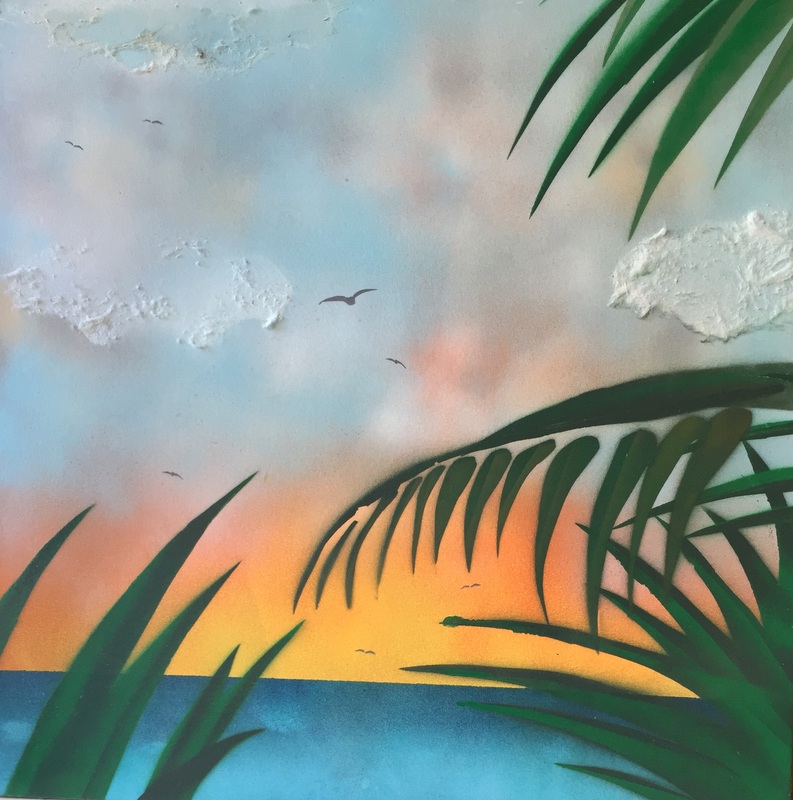 The palm fronds were done with stencils that I’d created and a layering of paint to achieve light and dark effects. The paint of the bird on the right is entitled ‘Freedom.’ Please note, that I change the titles of my work on a whim; mainly because I can’t remember what I called them beforehand. 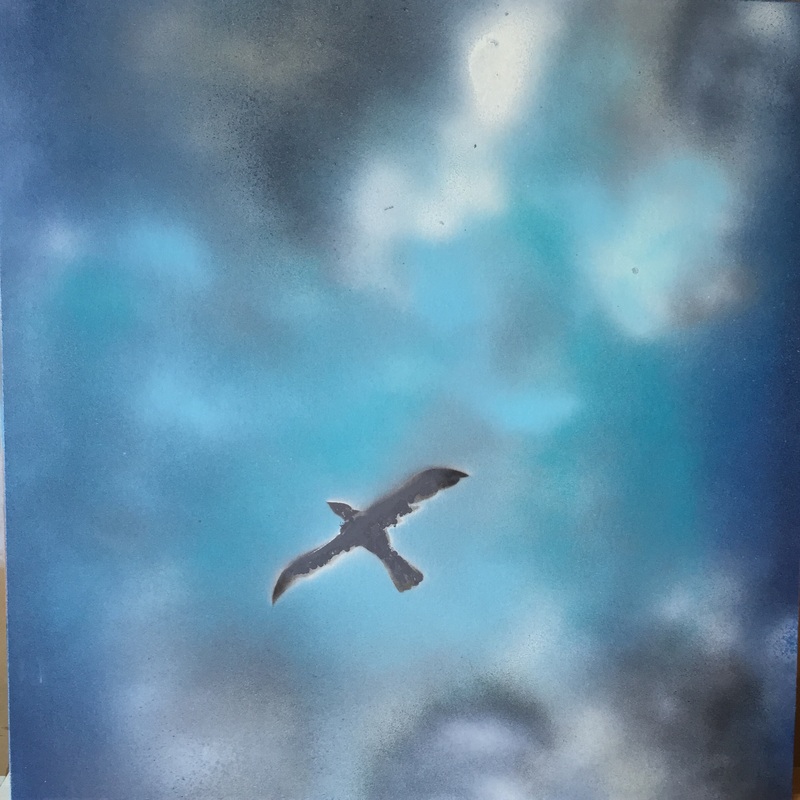 Anyway, the clouds are done with spray paint and the bird is stenciled. I suppose these two paintings draw from the time I spent in Southeast Asia and Hawaii. Moon Forest. Spray Paint on Drywall (Gypsum Board). 24″ x 24″, 2014. Moonbeams. Spray Paint on Drywall (Gypsum Board). 24″ x 24″, August 2014. Alien-scape. Spray Paint on Drywall (Gypsum Board). 24″ x 24″, August 2014. The moon seems to figure prominently in my work; some would call it lunacy. Here we have a series of spray paint on drywall works that explore the lunar surface. The large painting is one of my favorites from the early work, but is the second of the series. The first painting is the blurry moon in the upper right which made use a bucket to get the shape. The foliage was made using layers of spray paint. 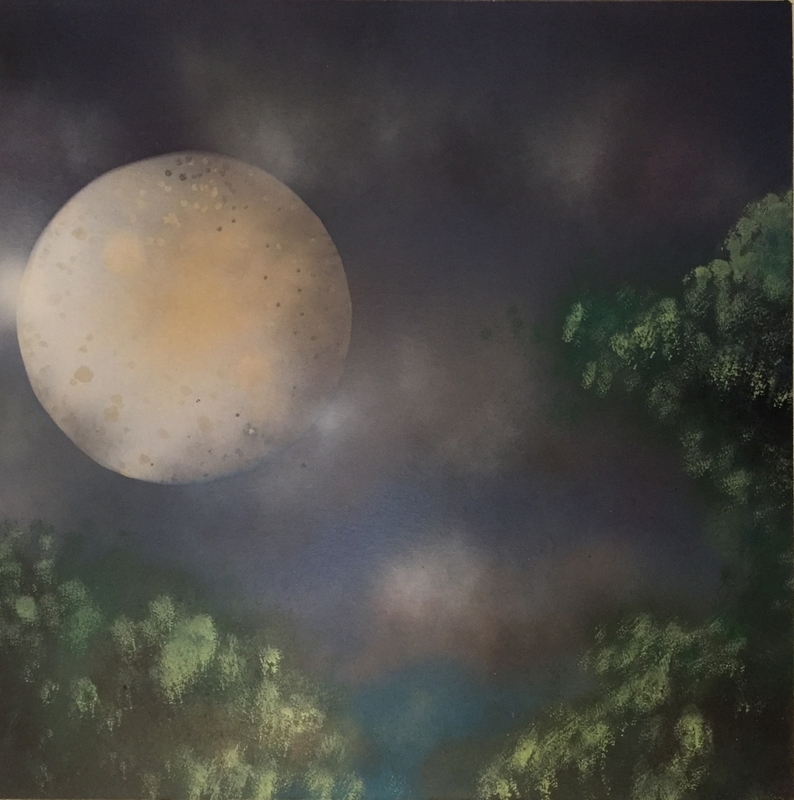 The large moon painting, currently hanging in my mothers house, has more detail than the first, and was achieved by placing paint caps and other objects around my garage on the drywall, then spraying in successive layers. This is also the painting where I developed the foliage technique you will see through the rest of my work. To achieve the leaves effect, I would spray onto a terry-cloth towel and dab the surface in mid-tones; then go light and dark shades as necessary. I think it worked out well. The alien landscape envisioned the surface of another world, complete with planets and moons, and odd scenery. It’s not one of my favorites, but it was fun to create. I’m a bit of a Sci-Fi nerd, so this is where I draw from in these cases. There was a book I read as a boy, I can’t remember the name, about an alien Eco-system taking over the Earth. The alien flora and fauna was described as red and pink; which maybe had a role to play in the production of this work. As you may or may not have noticed, many of my early works are not named. For the most part this was a practice, exploration phase for the real work to follow. The above paintings are some early landscapes using a combination of spray paint and the dabbing technique (for lack of a better term) for the foliage. In the painting of the wagon trail, located on the right, I experimented with using a board and white paint to simulate sunbeams shining through the trees. You’ll also start to notice that I’ve brought forward the multi-color dabbing from the alienscape above to simulate flowers. St. George’s Bad Day. Spray Paint on Drywall (Gypsum Board). 24″ x 24″, August 2014. Mountains. Spray Paint on Drywall (Gypsum Board). 24″ x 24″, September 2014. I’ve had some real misses as an artist, but I guess that’s part of the beauty of exploration. The painting on the left is one of the examples. It’s titled, St. Georges Bad Day, or something like that. The proportions are off and really it looks like a first grader worked on it. Probably the coolest part about it is the shadow of the dragon; otherwise its quite forgettable. The window scene on the right is actually unfinished. I had originally intended to paint the portrait of a woman over what you see, but I loved the mountains in the background so I let the landscape stand on its own. Mountains were new to me for this, so I had to channel Bob Ross and a putty scraper from Home Depot to make it work. I’m still using spray paint and stencils for this one, but at the same time you’ll notice that brushwork starts to make inroads into my process. I again experimented with sunlight, but ended up not getting the results I was looking for. Sunset with Ants. Spray Paint on Drywall, 24″ x 24″, August 26, 2014. This is an example of where earlier work in spray paint, brushwork, dabbing and use of stencils coalesces into something that actually surprised me. Although there are still things I don’t like about it, you’ll see that it stands up to scrutiny better. The idea behind this painting, which has the same dimensions and medium as the previous works, is a bugs-eye view of a sunset. Treescape. Spray Paint on Drywall, 24″ x 24″, August 29, 2014. I consider this the pièce de résistance for my work in the spray paint medium; which is why I gave it its own space (along with the one above). Notice the moon hidden in the branches? There are still things wrong with it, namely the branch lighting, but overall it works. The new technique I tried out for this is the bark. Having no idea how to represent it, I spent hours outside observing trees. I’m also beginning to really focus on perspective and lighting as I paint with this piece. As the summer of 2014 turned to winter, I needed to move inside. I couldn’t use spray paint in an enclosed space without extreme health risks, not that I cared at the time, so I decided to switch to acrylics. Winters Day. Acrylics on Canvas-board, 11″ x 14″, December 2014. Winters Day was my first acrylic ‘scape’, I’d worked on other portraits and animal paintings prior to doing this one, so some of the techniques used were not a direct continuation of the spray paint process. What is of importance, is that I started using metallic paints to simulate light hitting the various objects in the piece, as well as working more with perspective. I should note, I’m not a graduate of any art program, nor did I allow myself to use the Internet in discovery of techniques at this time. I really wanted to learn painting on my own, to not follow in others footsteps. This is why I still cling to the ‘outside artist’ title. As a result, everything is trial and error. Nature’s Bosom. Acrylics on Canvas, 11″ x 14″, January 2015. Twilight. Acrylics on Canvas, 11″ x 14″, July 28, 2015. I’m infatuated with dusk and dawn, so a lot of my work is set at these times of the day. Twilight was my first foray into running water. I painted by observation of a stream that was near my flat. I’m sure there are better ways to do it, but as I said, it’s all trial and error. Another new technique I worked with was blowing white paint through an air-duster can straw to make the stars you see in the background. A Storm at Sea. Acrylics on Canvas, 11″ x 14″, 2015. Sunset at Sea is another unfinished landscape that I let stand on its own. There was supposed to be a bird somewhere in here as the focus, but that idea went out the window. 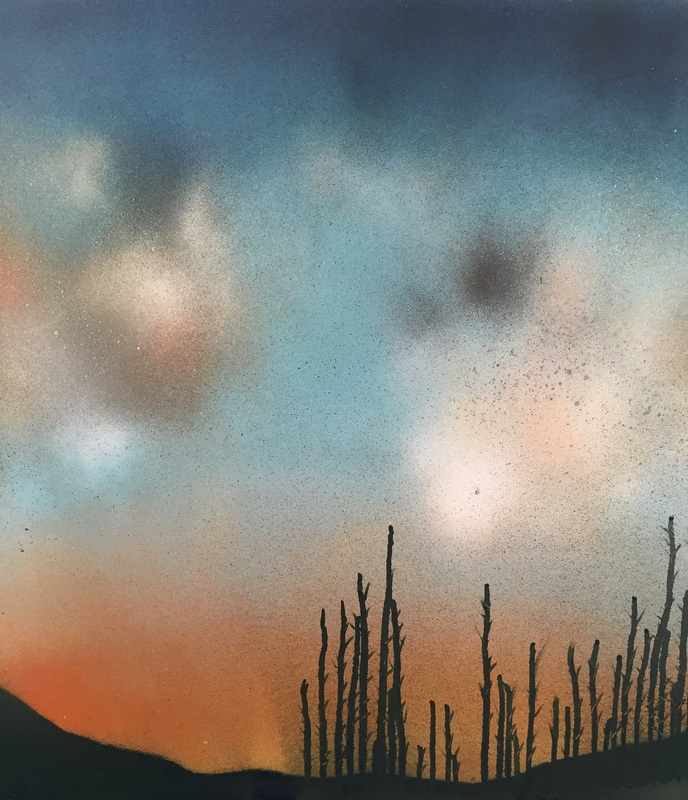 I attempted to recapture the success of spray paints for the hues of a sunset. Being that it’s all brushwork, I don’t think it turned out half-bad. Sunset. Acrylics on Canvas, 11″ x 14″, August 2015. I’m a huge fan of Caspar David Friedrich and the Romanticism movement in Germany. In fact, I made it a point to travel to Berlin, where his most famous works are kept. I guess in a way, once you have a room dedicated to you, you’ve made it. Selfie with my Favorite Friedrich Painting, Berlin, June 2015. As you can see with the above two images, Friedrich definitely influences my work, even to an unconscious level. Of course he is a much, much, better artist; but it’s good to have heroes. In the painting I did, ‘Sunset’, I left the brush-strokes as a way of bringing texture to my art. During this period is when I’m developing the 3-D approach to painting and would influence later abstract and mixed-media work. The theme of the painting is Dusk, the end of the day, or the Götterdämmerung. You’ll see this theme repeated through a lot of my work; probably due to ongoing issues with depression. Autumn Moon. Acrylics on Canvas, 11″ x 14″, October 2015. I mentioned that I branched off into abstract work for a while. I guess if you look at my progress from 2014, it’s like a tree; with different branches exploring various media and techniques, then ultimately blending back int with one another. So maybe it’s not a ‘tree’, but brambles. The work above is abstract and heavily textured. 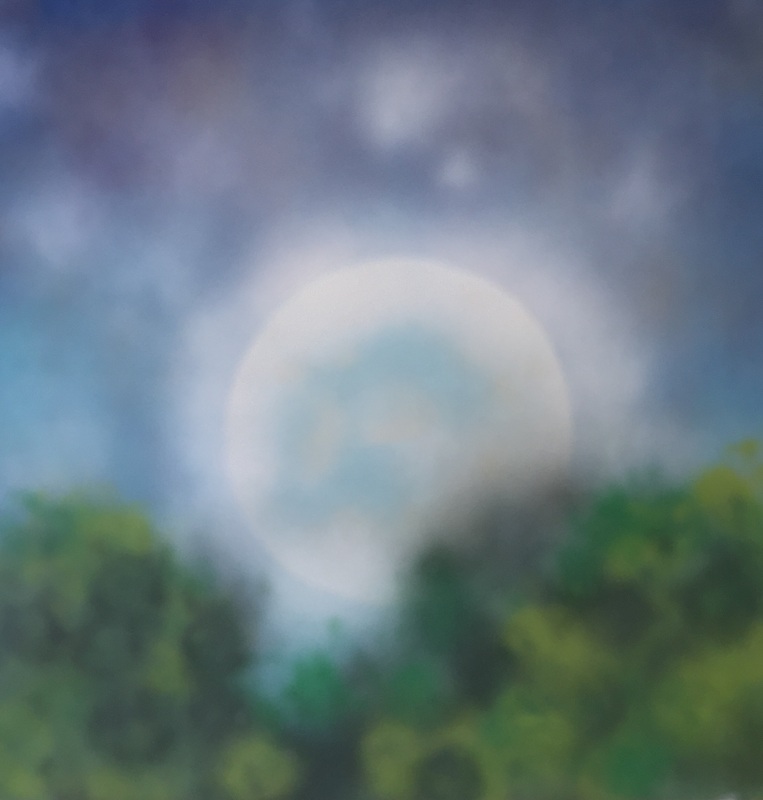 It’s another moon focused landscape. Lake at Night. Acrylics on Canvas, 11″ x 14″, July 22, 2015. Water. Water is hard to paint, unless you are Bob Ross. I had no idea how to paint water when I did this work, and so I did the best I could with ersatz (improvised) techniques. I also carried forward the creation of stars via blowing white paint through a small straw. The Götterdämmerung. Acrylics on Canvas, 11″ x 14″, August 2015. 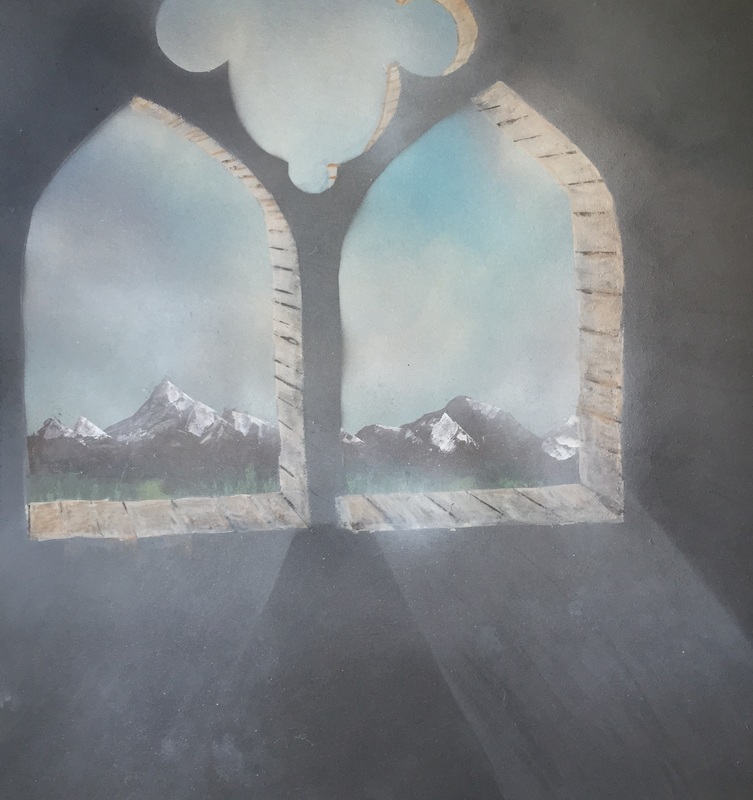 Another Friedrich inspired painting. You’ll notice in a lot of my work, I have Victorian era figures prominently represented. I love the Victorian / Gothic style of dress and strive to include it where I can. This painting carries over – or is a precursor to, since I can’t track down when I painted it, a work that can be seen in the portrait section of the site. Moonlit Forest. Mixed Media on Canvas, 18″ x 24″, 2016. I usually can’t sleep at night, so I took the pre-dawn hours and cleaned my garage in order to set up a spray paint booth (rather then the garage floor with appropriate Dexter-style plastic sheeting; because I want my deposit back. It’s much more sophisticated than what I was using when I started (the aforementioned entirety of the garage), and easier on the back). I even did this ‘doodle’ to test it out. The painting shows the evolution of various techniques, including a harvest-style moon, the dabbing technique for the foliage and different color stars. This is also a combination of spray and acrylic paint. An Evening Walk. Acrylics on Canvas, 12″ x 22.5″, February 18, 2016. My favorite time of the year is the fall. I love the myriad colours Nature is capable of bringing out in my surroundings. 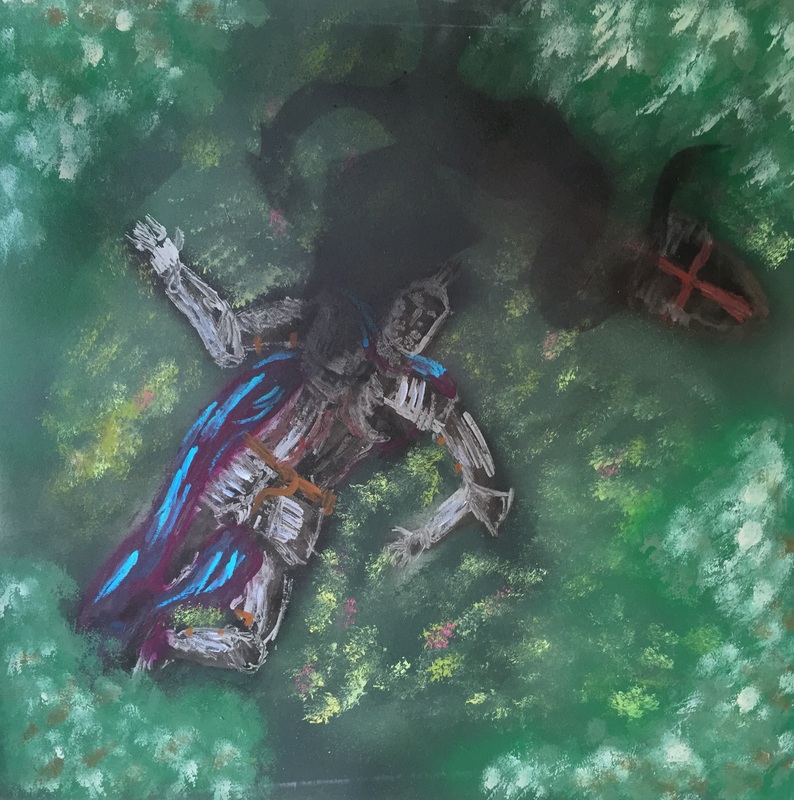 This painting uses a fall motif and incorporates Gothic figures. I believe around this time I was drawing strength from the Impressionists, like Monet and Manet; as well as Cezanne. January. Mixed Media on Canvas, 18″ x 24″, August 12, 2016. A cold January evening, as the last rays of the light ephemerally touch the clouds, the tree embraces the cold brilliance of the street lamp in hopes of seeing the Sun again. 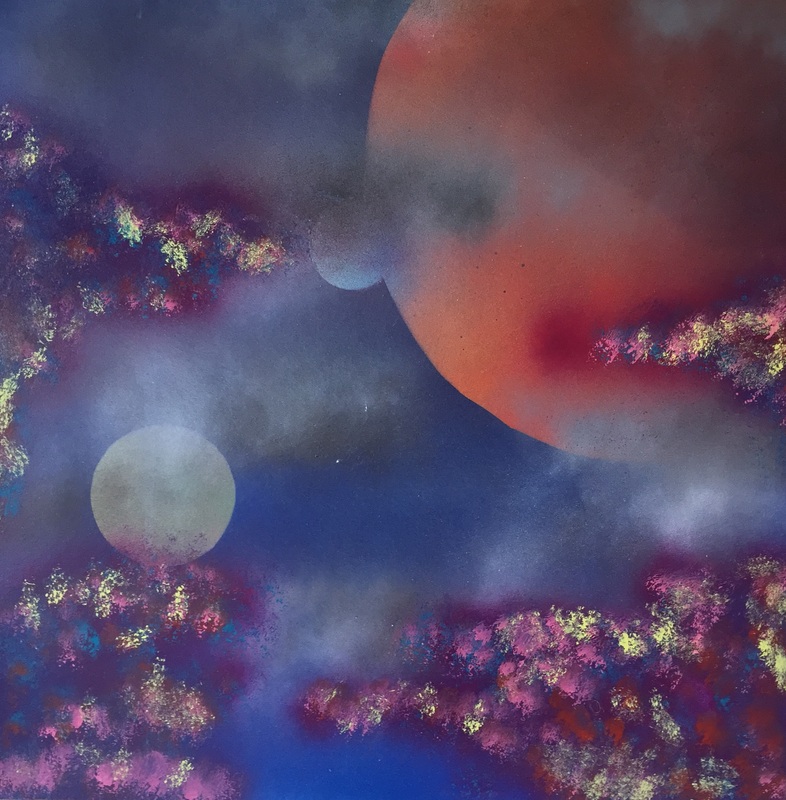 I fell back on spray paints for the sky, as they can so much more convincingly portray the vibrancy of the sky. The motif again is drawing on darkness, mysticism, depression and hope. This sold literally before the canvas was dry. I think it’s one of my quintessential works; in that it draws elements of Romanticism (Friedrich), the Götterdämmerung, and combines so many techniques I’ve been working since the beginning in 2014. The title, ‘The Murder’, draws from object quantifiers – a group of crows is called a murder. Harvest Knights. Mixed Media on Canvas, 18″ x 24″, August 31, 2016. Deep in the night, under the blood moon a pair of knights rush along a deserted road, past ruins of long forgotten folk towards an urgent engagement. At least that’s the idea. The skills never match the concept. This is also mixed media because of the spray paint background and the acrylics used in the foreground. My favorite part, besides the moon, is the reflection of the bridge on the water. The Forest. Acrylics on Canvas, 18″ x 24″, October 17, 2016. I originally was going to use this as a background for a Halloween painting (my favorite holiday). Halloween has come and gone, and so I decided to let it stand on its own. Most people don’t appreciate the woods, but every time I’m in nature, I feel that connection between man and the environment. So, while the painting may be boring in a media-filled, sound-byte ridden world, I think there’s a certain peace to it. New techniques to be found in this? Linear painting, maybe? I’m mostly practicing things I’ve developed in the past. The hardest part of art , in my opinion, is getting light right in the woods, as there are so many contrasting areas of light and dark colors. Throw in streaming sunlight and one is tempted to cast aside the brush and bow to nature’s perfection. This is an imperfect representation of that beauty. I briefly flirted with oils after watching some Bob Ross on Netflix. I realized that brushes are much harder to clean, the mineral spirits are harsher on the environment and I generally do better with acrylics. Ship Coming into Port. Oil on Canvas, 8″ x 8″, 2016. This is my only oil painting. Someday I may return to oils, but it will need to be when I’m in my own artist space, where I can fling paint without losing my security deposit.